The original plan for this race was to race with Mojito's on Monday - Erik Wise and Jeanette Ciesla. He had recruited Jim Gorton and I to race, but a last minute injury took Erik out - and the team was whittled down to Jim and I. The history of this race is simple - survive the incredible heat from the daylight portions and then survive the challenging night navigation. If you do both of those well, then you will do well in the race. The race started with a roughly 8 mile trek to the boat TA. We started through the city of White Springs, eventually ending up on trails and dirt roads. I had spent a lot of time copying in roads from the "supplemental" maps that were available at the start table. Even though we were nearly the last team to enter the woods an get to CP1 I was not worried. A due east buswhack from CP1 across to the trail proved to be no faster than walking as we left CP1 with Jeff Leininger, went straight across, an ended up running to him at the trail heading to CP2. At this point I had an option of cutting the corner - but Jeff convinced me to not do this as he knew the terrain near the waypoint where we took a bearing to CP2 was wide open. It was - and we quickly got CP2 and headed with Jeff and Hunter to CP3. We had caught a few teams looking for CP2 and b y the time we hit CP3 - we had about 5 teams near us. Some of those teams went south at the intersection of R4 and R5 - we chose to go straight across on R4 and that actually put us ahead of quite a few teams. The right turn to R2 and the creek were pretty obvious and we made up even a bit more on the teams ahead of us. We made up even more time by turning North (near where CP7 - Paddle point) and taking the roads. We saw Nature Calls ahead of us taking the trail and came out in from of them at CP5. It was a short hike to the TA and the boats. The paddle leg was simply fun. The water was quite hot, which was sad since I was hoping that it would be a nice cool off from the heat of the trek. We easily ran the rapids at Big Shoals and avoided most of the other rocks. Big Shoals was a good rapid and we picked up a bit of water on the drop. The navigation was relatively simple and we had quite a few solid teams working together. We ended coming out of the water with Northwest AR and had a really good paddle time. This is where the race or at least the navigation got tough. The only trail mapped on the provided maps was the bike trails. The cutoffs, dirt roads, shortcuts, firebreaks, and foot trails all were not mapped. It started off bad. Even though we were the first team to reach the vicinity of CP11 - after 30 minutes of searching there was still no control and every other team in the race had by then caught up with us. I finally found it by bushwhacking to the river, figuring out my exact location and then using that to take a direct bearing and find the CP. We left the CP first (we found it first - though I suspect Northwest Florida AR had found it and snuck out). We took a wrong turn and ended up spending 30 minutes searching in the wrong place for CP12 before we discovered our error. By "we" I mean us and Team Hammer which were working together. After figuring out our error we quickly found CP12 and CP13. The trails near CP14 made no sense and seemed to have no relation to the map - so Team Hammer and our team planned to head to the road and then backtrack to CP14. 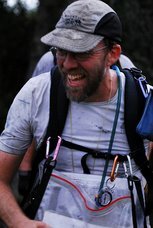 Along the way we ran into Craig Sheriff who was leading Team Wet Feet - and the three of us found CP14. Outside of the fog making visibility of the river challenging, this was really just an enjoying night paddle with no real issues on the navigation. I had no trouble finding any of the controls and we had decided to work with Team Hammer and Team Wet Feet. This was the leg that I figured would make or break the race. Night foot navigation is my favorite thing - I love the challenge. I love looking for the subtle clues - it is just awesome. I had drawn in as much detail as I could from the supplemental maps to help make this as easy as possible. CP24 and CP25 were easy and we headed into the woods north of CP26 on the orange blaze trail. We found CP26, headed to the long E-W road, headed 1 km east to the road end, went in 100 meters and found CP27. This control hurt a lot of teams. We headed back west to the orange blazed trail where we had come out earlier and followed it south to CP29. From there we headed NE, bushwhacked across to the road (River Road). Finding CP 28 was a challenge - no obvious attack point, clue was center of open woods. Having a few teams to help us out worked out well, though somehow we lost both Team hammer and Team Wet Feet - and had to call them into the control (which took about 15 minutes) - but at this point I wanted us all together. CP30 was easy - and soon we were back at the TA. By this time we kind of had the bike method done. We did get CP38 and then come back to the trailhead an went the other way towards CP31. I cannot say these were easy as they were not an following the bike trail at night was challenging. By the time we got to CP34 we had sunlight and also a group of teams following us (I think at one point 6 teams) - one it was light I was really enjoying the single track. We had no issues with nav at all after the sun was up - and were pretty sure we would have a decent finish as only Northwest Florida AR had left on this leg with all poins completed before us. Only 4 teams cleared the course - and a lot of teams had issues with a single control that cost them placement. I was determined to clear this one - and having the ability to work with other teams did help. Congratulations to Northwest AR (with Rev3 navigation) on a great race. This was an incredibly fun race and it was great to feel good again after being sick at he Rogaine World Championship a week earlier. Greg apologized for making the race navigation too hard - though I thought it was challenging, it was not undoable. It would have been nice to have a little more detail on the maps - but I was able to handle the lack of detail and as you can see I drew in a lot of roads and other trails.